Toyogon defends against Japanese. 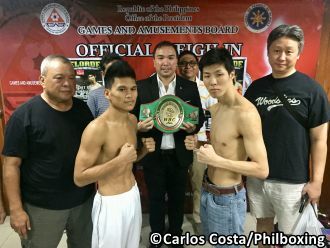 WBC Asia Silver Champion "The Rock" Al Toyogon of the Elorde Stable weighed-in at 127 lbs., while challenger Ryusei Ishi of Tokyo, Japan, came-in at the limit of the division, 130 pounds, for their 12 round rumble for the WBC Asia Super Featherweight belt Saturday (Jan 26) and the famed Elorde Sports Complex in Parañaque, Metro Manila. The battle is Al Toyogon's the first title defense of the belt he earned by stopping fellow Pinoy Nathan Bolcio, 28, last September at SM MOA in Pasay City, Manila, a rough rumble in which the brave Bolcio visited the canvas three times. Fans have noted that the well-trained Toyogon (9-2-1, 6 KO's) who hails from Gingoog City, Misamis Oriental, has improved much in recent months, scoring devastating knock out wins in his last four fights, including the one over Bolcio. But the confident, tough-as-nails Ryusei Ishi is in the Philippines aiming for a impressive victory. His target, the head and body of Toyogon. His goal the WBC Asia Super Featherweight Belt for Japan. Will this young samurai prevail Saturday night at the Elorde Sports Complex? Or will it be the Filipino the victorious one, punishing and stopping the strong and taller Ryusei Ishi to retain his WBC Asia Silver strap? You have to be there! Toyogon vs Ishi for the WBC Asia Silver Title at Elorde Sports Complex in Sucat, Parañaque is a production of award-winning promoter Gabriel "Bebot" Elorde Jr. The author Carlos Costa is a veteran fight reporter based in Cebu. Carlos can be reached by email carlos512@hotmail.com and whatsapp 09184538152.